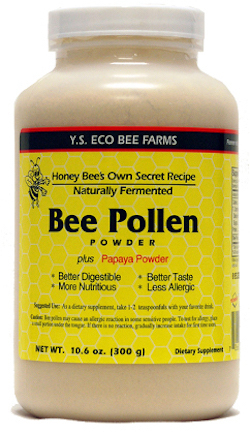 Bee pollen powder with papaya powder makes it more easily digestible, better tasting, more nutritious and less allergic. Whole Bee Pollen granules have a naturally occurring protective outer shell. Some individuals who have compromised digestion have difficulty digesting this outer shell resulting in digestive upset. Many times these individuals are labeled as being "allergic to bee pollen". Changing to more easily digested Fermented Bee Pollen has helped many to be able to use Bee Pollen in their daily regimen and quest for good health. It might also be noted that the cleansing effects of live Bee Pollen has been labeled as an "allergic reaction" although it is not always the case. To find out if this is the case, many individuals have taken it upon themselves to start with a smaller serving size (about the size of one granule) and gradually increase (one granule per day) to the desired serving size with no more negative reactions. Naturally fermented using orange and papaya. Please refrigerate upon receipt of shipment. Suggested Use: As a nutritional supplement, take 1 tsp. once or twice daily with your favorite beverage. For best results, take regularly on an empty stomach. Studies have shown bee pollen may help build immunity to common allergies.